We are Gilderson & Sons Funeral Directors in Forest Gate, and with our compassion and professional guidance, we can make a difficult time a little easier for you and your loved ones. The wellbeing of you and your family is everything to us, which is why from the moment you reach out, we will be here for you every step of the way. From arranging your favourite flowers, to finding the perfect tribute, we will make sure the funeral is exactly how you want it to be, right down to the last details. Our funeral home has recently had a brand new wash and dress area built. You can use our modern facilities in the knowledge that they are of the highest standards, in order to give the best quality of care to every individual. We are also conveniently located close to the beautiful Manor Park and Crematorium. As Dignity Funeral Directors, you can put your trust in our years of experience, as well as the strict codes of practise we follow as part of the National Association of Funeral Directors. Gilderson & Sons will make your loved one’s funeral a unique and personal celebration of their life. Please give us a call at any time on 020 8472 0131 so we can be there for you. 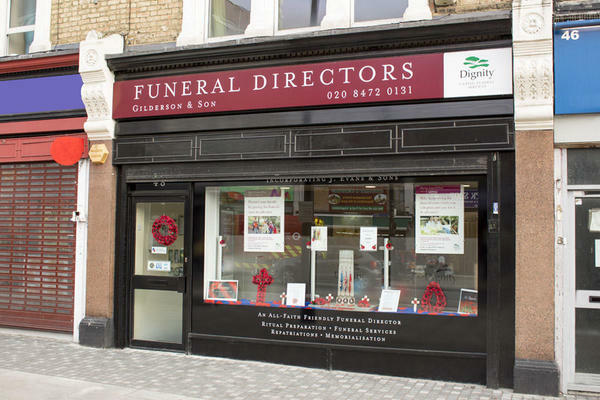 See our funeral homes in Barkingside and Illford. You can park on surrounding streets, paid by cash or on the phone. We are located near Forest Gate Station between Hampton Road and Osbourne Road. Our staff are available 24 hours a day on 020 8472 0131 if you require our services outside of these hours.